Isiah Factor | The Insite » I KNOW YOUR FRIEND WAS JUST KILLED BUT DO YOU WANT TO BUY AN ICE CREAM? I KNOW YOUR FRIEND WAS JUST KILLED BUT DO YOU WANT TO BUY AN ICE CREAM? April 29, 2009 | Posted in Uncategorized | Comments Off on I KNOW YOUR FRIEND WAS JUST KILLED BUT DO YOU WANT TO BUY AN ICE CREAM? APPROPRIATE OR NOT: YOU DECIDE ON THE INSITE! Capitalism rules no matter what. That may just be the attitude of some northeast Harris County neighborhood ice cream men. I was on the scene of a very tragic death Wednesday. 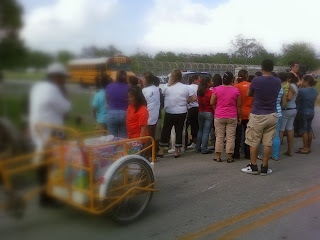 Dozens of people were standing outside near the remains of a 15 year old female student. She was run over by a school bus. Many of the victim’s classmates were crying and breaking down. Then out of the blue comes what? A man pushing an ice cream cart. He started asking distraught people if they wanted to buy an ice cream as they wait for their friends body to be peeled off the street. Come on dude, now is not the time for you to try and make a buck. What do you think?